After spending the last five minutes watching my dog, Max, snoring, I’m questioning the observer effect, where the act of observing something changes it. Mind you, I’m not a physicist, and Max is a law unto himself. If I was playing Pneuma: Breath of Life, Max would probably end up hovering in the air, or maybe he’d become an elephant instead of a labradoodle. But I’d also be a god, so this would not phaze me. Pneuma is an oddity and remains enigmatic even after watching a trailer and getting given the apparent gist from the developers, Deco Digital. It’s a first-person puzzler, where you – a god – have to navigate a conundrum-filled maze, solving puzzles through the power of your mind and observation. 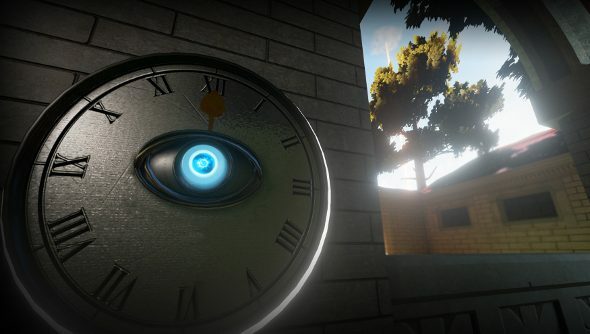 These first-person puzzle games never just task you with going down to the shops to get some milk for you tea, not when there are philosophical quandaries that remain unanswered. Using the power of your godly noggin, you’ll be able to lift bridges, rotate platforms and even move entire rooms. You do this just by observing, by looking at a specific point. Given that you’ll be primarily manipulating the world by looking at it, it’s seems like a good fit for VR, and it will support the Oculus Rift DK2. “Virtual reality only adds to the experience,” the devs say. Unfortunately, only the VR-less Xbox One version has a release date, but it’s also appeared on Steam Greenlight and Deco Digital’s plans are to release it on PC as soon as possible, along with VR support.